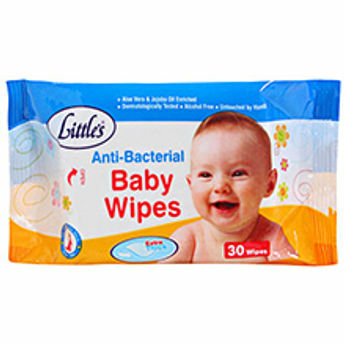 Little's Baby Wipes are ideal for gently cleansing and moisturizing your baby's delicate skin during diaper change or for cleaning your baby's face and hands during mealtime, playtime and while traveling. Enriched with the goodness of Aloe Vera and Vitamin E, to ensure that your baby's skin remains soft and moisturized, while the gentle fragrance of the wipes keeps your baby fresh and happy all day long. The wipes are extra thick and soft and contain hypoallergenic ingredients that are clinically tested to ensure that they do not cause any irritation to your baby. Can also be used by adults to cleanse and freshen up. Little's wipes are excellent for use by the whole family, anywhere and anytime. Enriched with the goodness of Aloe Vera and Vitamin E to keep baby's skin soft and moisturized. Extra thick, soft and contains hypoallergenic ingredients. Additional Information: Founded in 1980's by Voltas, Little's has garnered great trust amongst Indian Parents over the last three decades. Today Little's has wide range of baby products and accessories for every life stage of a child from 0 to 4 years of age, keeping both parents and baby happy, cheerful and comfortable. The extensive range of products includes Feeding Bottles, Grooming and skincare products, travel gear, bath time products, toys, gifts and much more. All Little's product are safe and made from best quality material. Explore the entire range of Cotton Buds, Balls & Wipes available on Nykaa. Shop more Little's products here.You can browse through the complete world of Little's Cotton Buds, Balls & Wipes .